In a significant step forward for American bike infrastructure, the Federal Highway Administration issued a memorandum late last month essentially endorsing street designs like protected bike lanes. In the memorandum, FHWA urges transportation engineers to use the guidelines issued by the National Association of City Transportation Officials, which contains templates for bikeway designs widely deployed in Europe but shunned in the U.S. until very recently. This federal endorsement is critical because protected bike lanes have yet to be officially sanctioned by the country’s most influential transportation engineering organization: the American Association of State Highway and Transportation Officials. AASHTO publishes the “green book,” which for many transportation departments serves as the bible of street design. But, being a bit stodgy, AASHTO has never included protected bike lanes in its standards, despite mounting evidence that these designs improve safety. The exclusion of protected bike lanes from the country’s most important engineering guide has stymied growth, since U.S. transportation engineers generally hesitate to use designs that don’t have the imprimatur of AASHTO or FHWA. The FHWA memorandum encourages its divisions around the United States to be “flexible” in bicycle design, and refer to both the AASHTO and the NACTO guides for assistance. “It’s great news,” says Martha Roskowski, director of the Green Lane Project, an initiative that promotes the adoption of protected bike lanes in American cities. The Green Lane Project recently surveyed transportation professionals around the country about the barriers to installing high-quality bike infrastructure. More than 90 percent of respondents reported it would be helpful or very helpful if FHWA would endorse the NACTO guide. Many American engineers have felt reluctant to install protected bike lanes, thinking they could held liable for deviating from federal guidelines should a collision occur. As a result, some states, notably California and Illinois, have measures that prevent cities from installing protected bike lanes in certain circumstances. Roskowski thinks this endorsement from FHWA will help resolve that. Roskowski said she believes the memorandum is an interim measure, until FHWA develops its own bikeway design guide, which is expected in about a year. Really? I have not been in all of Europe (that would be nice!) but the NACTO guide certainly contains templates for bikeway designs that are rightly rejected in The Netherlands because they are insanely dangerous. For example, bike lanes in the door zone of parked cars, so that the most dangerous place on the entire road to ride a bike… is in the bike lane. Insane! NACTO also features bike lanes that are dangerously narrow, and sub-standard intersection designs that pose a lethal hazard to cyclists. The NACTO guide is, quite frankly, an inferior design standard that should be rejected. I think the point is that the NACTO guide _also_ contains European-style bikeways, whereas the AASHTO guide _only_ contains door-zone, unprotected bike lanes. Is the CROW publication only available for purchase? I couldn’t find an online pdf or anything of it anywhere. And not to be picky to the original article, but I recently came back to the US after living in the Netherlands and traveled quite a bit around Europe during that time and let me just say that nothing even remotely approaching the amazing Dutch bike infrastructure is “widely deployed in Europe.” Most other European countries are way behind the Dutch in that regard. Not that it really matters, but just wanted to further underscore Kevin’s point that it is the *Dutch* we should specifically be looking to for much guidance (honestly, I even found that Denmark’s bike infrastructure–while still leagues better than is found typically in the US–is not up to par with the Dutch “gouden standaard”). I guess it’s certainly another step in the right direction, though, that protected bike lanes now have FHWA support. As a cyclist and a traffic engineer, I’m intrigued by protected bike lanes, but I haven’t yet seen a good analysis of their safety performance at intersections, specially unsignalized intersections and driveways. I would have been happier to read Angie’s article, but then read Kevin Love’s comment. Indeed, as John Allen has said elsewhere, let’s not claim to be copying good European designs but instead do it badly, thus offering American cyclists the worst of all worlds–high expectations and poor delivery. I read through the NACTO guide a few months ago and found some things that disturbed me deeply. While it endorsed protected lanes, it listed as optional some of the critical intersection controls that are required to protect cyclists who are entering intersections. Let’ make sure we dot all our i’s and cross all our t’s as we move forward. Meanwhile, I’ve seen many of the installations that our traffic engineers (or somebody!) have apparently signed off under the present U.S. guidelines, and they can be downright awful, such as those coffin corner bike lanes that seem to escape a good P.E.’s red pen. We need to do better, if we are to do it at all. Actually I liked Copenhagen better than Amsterdam for biking. But these are both wonderful countries for biking because they do bike infrastructure with care and science – the prevailing principle is safety for pedestrians and bicyclists first, then cars if they can fit! Alas, the CROW standard is only available for purchase. And not cheap either, at 87 euros. And yes, The Netherlands is by far the world leader in how to do cycling infra right. Which is why their traffic design engineering cycle standards should be the ones that we adopt. Let us benchmark proven success and follow the experts who have achieved that success. Yes, intersections are of vital importance. For example, Ontario’s Ministry of Transportation has found that 63% of injuries due to people being hit and crushed by car drivers happen at intersections. Here is a video showing how to do intersections right. Note how at the beginning of the video it explicitly criticises the NACTO guide! It is important to see the videos and imagine what it would be like to have this infrastructure in our own cities and towns. What a transformation for the better in our lives! Does anyone have recommended reading for bike treatments at bus stops? I took a quick look at a few of the bike lane varieties on the NACTO website but I didn’t see interactions with bus transit addressed anywhere. As there are potential conflicts for space near the curb when buses pull over and stop, I’d like to learn more about practical and safe bus stop treatments for bike lanes (buffered and not) and cycle tracks. Things like the “Copenhagen Left” and insufficient separation from roads to me are indicative of less sophisticated design techniques, and bad infrastructure elements like those do in part explain Denmark’s lower cycling levels than those found in the Netherlands. Of course Denmark is still quite good compared to the rest of the world, but as that blog post rightly (I think) points out, it does seem silly to make all the effort just to copy second-best. Note that in the video, the reader points out that each mode has its own yield and allowed phase, i.e. green light phasing protects each mode in the intersection. Sure, it means you have to obey the light. But that is enforced in some parts of Europe by draconian fines, ensuring a higher degree of compliance. Here are two videos showing how to eliminate the conflict between cyclists and bus stops, showing how to do this and providing several “real world” examples. The fundamental principle is to route the cycle path behind the bus stop to eliminate the conflict. It is also nice to provide adequate cycle parking at the bus stop for people who ride their bike to the stop and then get on the bus. By “stodgy” do you mean a scientific research, evidence based process? The AASHTO Bike Guide was/is developed under the NCHRP, part of TRB, which is part of the National Academy of Sciences. Even better is when the green wave is slowed from 30 MPH to 12 MPH and cyclists move right along with the flow, never needing to stop. I clocked buses on these streets in Copenhagen, and they were not delayed by the lower green wave speed – I was pleasantly surprised. The pleasure is in the details – synergistic details. Copenhagen has been fitting bikes into a 150 year old infrastructure, and has even has to deal with auto oriented “suburbs” of the 1950-70s that are not so different from some of the US. Strangely, Holland has had some extensive de-novo construction opportunities that will be far superior to retrofitting cycletracks into spaces they weren’t designed for. But as you all noted, both Denmark and the Netherlands “average” far exceed AASHTO guidelines, and both are infinitely better than what’s on the ground in the USA. As somebody who spent quite a few years in federal agencies, as a TRB reviewer, and with related peer review programs, I have a view from inside the sausage factory. Let’s just say that calling AASHTO “stodgy” is being very polite. Second problem with AASHTO – even when the general guidance is good, agencies nearly always use AASHTO “Minimums” as the Optimum / Maximum “Standard” design, not as a starting point towards what is really needed. “The design meets minimum standards.” should not be the “industry standard”. The relatively high-speed IJtunnel approach road rudely bisects and separates otherwise quaint and livable Rapenburg street, with no pedestrian crossing really nearby (in fact there’s a freeway-style guardrail in the median making pedestrian crossings even more difficult). I remember my first mad dash as a pedestrian across the road at Rapenburg and it felt so wrong and…weird. I then realized it was because this kind of infrastructure is incredibly rare in the Netherlands so I’d never had to do a mad dash before. Of course the pre-tunnel street there (Valkenburgerstraat) still has a protected cycletrack, so it’s much better than most US equivalents, but I did notice that it was in general an unpleasant road even to cycle along since cars would always be speeding up in anticipation of the uninterrupted high-speed straightaway in front of them (or from which they had just come). This shows that it’s not some saintly Dutch driving nature, but how their carefully engineered infrastructure usually inhibits such behavior to the extent that the example I posted above is the rare exception. Thomas, B., & DeRobertis, M. (2013). The safety of urban cycle tracks: A review of the literature. Accident Analysis & Prevention, 52, 219-227. Lusk, A. C., Morency, P., Miranda-Moreno, L. F., Willett, W. C., & Dennerlein, J. T. (2013). Bicycle Guidelines and Crash Rates on Cycle Tracks in the United States. American journal of public health, 103(7), 1240-1248. These both deal with intersections… although I was also disappointed by the lack of information about driveways. A *real* cycle track would have very few driveway crossings, but I know a lot of the ones we’re building in the U.S. will have higher driveway prevalence. In other words, cyclists get to play tag with multi-tonne lethal weapons. Compare that to the above videos showing many, many bus stops in The Netherlands, all of which protect the cyclist. What a waste of tax dollars developing crappy sub-standard standards. All that wasteful government spending can be eliminated by simply using the Dutch CROW standard. What is an “intersection bus stop”? This looks like a dream I had once. It’s so simple and beautiful that I can’t help but want it NOW haha. The bus stops at, or directly before, an intersection. As opposed to far enough away from an intersection so as not to interfere with the protected intersection’s protection of cyclists. Does anyone know of any metrics related to the bicycle count that city planners, traffic engineers use when adding new bicycle lanes? For ex. does the minimum number of bicyclists have to be 200, 300, … per rush hour traffic on a street to justify a separated bicycle lane? Note: it is not the number of cyclists that pushes the requirement for a protected cycle lane, but the number and speed of car drivers. Otherwise you would have a “blame the victim” situation where car drivers threaten and intimidate cyclists off the road and that is used to justify not providing cycle infra. Thanks for the Irish cycle manual link. As you mentioned the 1.7.4 Guidance Graph only looks at the number of vehicles and their speed. Looking at the graph came up with few examples. a) For low speeds and 3000 AADT they recommend bicycles and vehicles share the road. Lets say for 300 bicycles per rush hour that would block traffic. b) For high vehicle speeds and 10000 AADT they recommend separated cycle tracks. If there are 20 bicyclists per rush hour that would be a very expensive project. Cycle tracks often require reducing the number of moving vehicle lanes. The above examples show that if the number of bicyclists do not figure in any rules, their guidelines do not work. So if there are no bicycles do city planners still build a separated bicycle track? We had been incredibly inspired to find this site. This is because this really is this educational write-up. As far as I know, the best (and perhaps only really good) study was done in Copenhagen. They used crash data for several years before and after the conversion of ordinary streets to streets plus cycletracks. They found very significant INCREASES in crash rates for both bicyclists and pedestrians. And by “rates” I mean crashes per user. 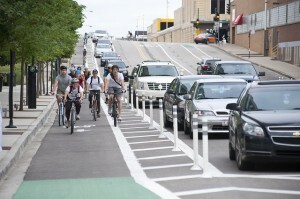 There were more bicyclists after the cycletracks installations, because people felt safer. But the people were actually at greater risk. Even “safety in numbers” didn’t work. Jensen, S.U., _Bicycle Tracks and Lanes: A Before-After Study_. North American cycletrack promoters ignore that. They’ve tried to sell these facilities using the mistaken feelings of safety. In one case, they compared supposedly similar streets, ignoring that the non-cycletrack streets had far more driveways and intersections, plus fudging with car-car crash data to generate their intended result. IMO, a cycletrack can be acceptable if there is high speed, high volume MV traffic, no intersections, no visual obstruction, and some special way for cyclists to make left turns when needed. In a city with driveways, turning traffic, parked vans and SUVs, and a need for cyclists to make left turns, they seem crazy.